A. We are a unique event venue that is great for groups of 10 up to 100. Consider renting our space for a weekday business meeting, an evening team building event, a weekend afternoon bridal shower, an all day studio space, or a weekend evening celebration. Q. Where is Reology located? A. We are located in downtown Lancaster - off the Harrisburg Pike - behind The Lancaster Arts Hotel - in a large warehouse building on the corner of Mulberry Street and West James Street. A GPS will get you to the correct building: 315 West James Street, Suite 105, Lancaster, PA 17603, but not the right entrance. Look for our main entrance off of Mulberry Street. We do have a parking lot! Q. Can we still do a project in the Studio? Q. How many guests can the venue accommodate? A. 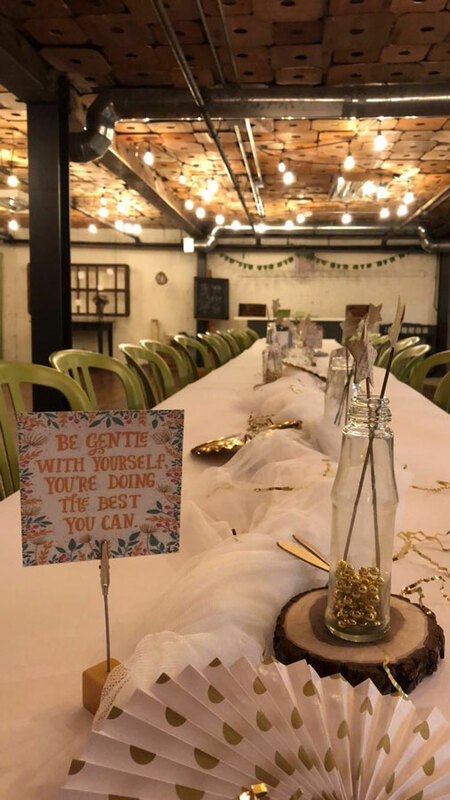 Our space can be a cozy intimate space for smaller groups of 10-30, a great venue for mid-sized parties of 35-65 guests, and we are also a great option for larger events with space for seating up to 100 guests. Feel free to contact us to schedule a visit to check out the space for yourself! We have 68 standard green chairs, 10 green cushioned chairs, 10 black composite chairs, 16 colorful folding chairs, 2 square tables for 8 each, 5 long tables for 10 each, 2 small mini square tables for 4 each, 2 bar seating areas for 4-5 each, and will customize the set up based on the number of guests attending your event. A. We love to celebrate! If you are planning for a smaller gathering, we might just be the perfect venue for you. Options for ceremony, cocktail hour, and reception! Talk to us about the possibilities! Q. Do you have WiFi and other IT options? A. Yes! We have WiFi available for your use. We also play background music during events, and we do have speaker hookups for other audio options. If you're looking to do a presentation or a slide show, we do have a projector and screen available for a $25 rental fee.